Well, I only needed 400 squares for my scrappy quilt — 100 for each block. Making it 2 x 3 blocks would’ve made it HUGE, so as I wanted a lap quilt I stopped at 4 blocks (actually I made 5, and intend putting the 5th one on the back as a snuggly place for my feet in winter, like the old quillows). With the sashing borders, more squares outside the sashing, and the main borders, this quilt is about 64 x 64 inches… plenty big enough for wrapping around me in winter (though it’s hard to think of winter when it’s close to 40C [104F] outside at the moment!). 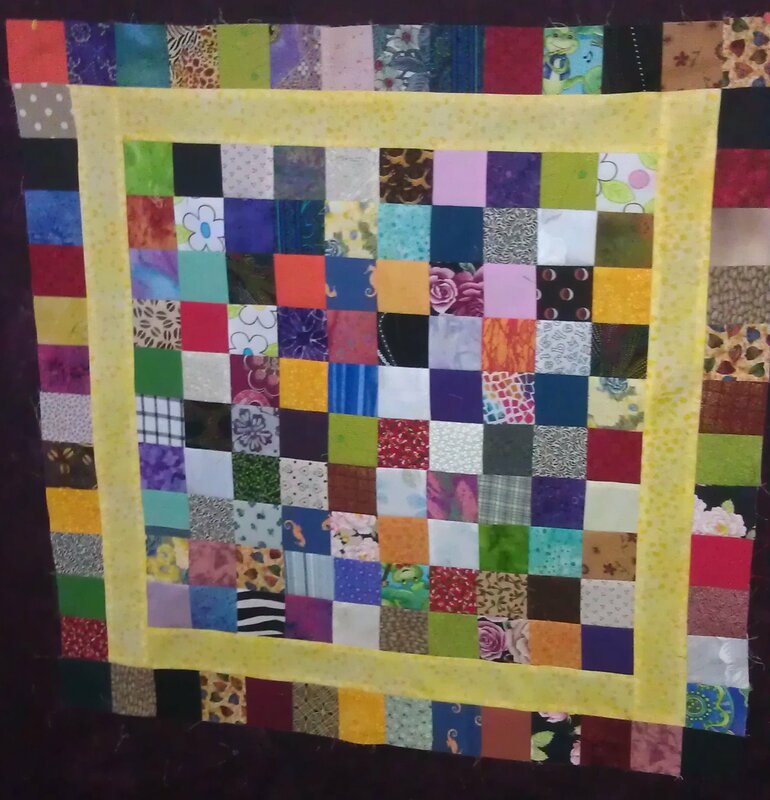 I’ve since added a wider yellow border in the same fabric as the sashing fabric around each block and put it all together ready for quilting. Actually, I started the quilting today, but I won’t take any more photos until I’ve finished it. While white would have been a better choice to set off the multi-coloured blocks, I decided to use only fabric from my stash and NOT buy any more. I had a few metres of this lovely clear yellow batik I purchased in Bali a year or so ago, and it looked fine when I auditioned it against the blocks, so I went with that. Besides, a quilt that is in heavy use in the living room while watching TV and potentially drinking red wine or eating a snack is just asking for spillage if I did it in white! The backing fabric as also from Bali, but that will remain a surprise until I finish it and take the photos.